How often does this happen to you? I was looking for some fennel the week before last to make pot roast out of a beautiful chuck shoulder roast that was on sale at the Apple Market, but it just didn't look good, so I passed it over and used celery root instead. No biggie - it was just as tasty that way. But last week, of course, the fennel looked gorgeous so I had to pick up a couple, even though I no longer had a specific use for them. I also had a five-pound bag of organic yukon gold new potatoes (they were cheaper than the three-pound bag) I had to find ways to use. So I started thinking about the two together. I try not to eat too much meat, so I didn't want to make another roast so soon after the last one (although the other half of that chuck shoulder is sitting in the freezer, waiting). I thought of chicken, but I'm just not in the mood for that, either (although there are four Amish chicken quarters also waiting in the freezer thanks to Amish Healthy Foods, which if you live in Chicago and haven't visited yet you really ought to treat yourself to a visit). What does that leave to make in this colder-than-usual winter? (Not that I'm complaining. I'm not. I much prefer winter to summer, no matter how cold and snowy it gets. At least I keep telling myself that.) Soup is the next logical step. I had the fennel, potatoes, some beautiful chickpea broth from the last time I cooked chickpeas, and a little cream. That seemed possible, so I got to work. And now I feel the need to say a word about chickpea stock, or whatever you call it. I no longer remember where, but a few years ago I read a tip that you should save the cooking liquid from when you make chickpeas, if you're not going to use it in the dish for which you cooked them. So I started freezing it whenever I had it, and whenever I was out of chicken or vegetable broth I would use it. As it turns out, it's quite tasty and adds a beautiful, velvety texture to your soups. It doesn't smell like much, and you wouldn't think it had any taste, but it also adds just the hint of nuttiness that enhances just about anything. I cannot recommend this highly enough. I wouldn't use the liquid in canned chickpeas (even organic, but that's just me), but it is worth it to cook your own chickpeas so you can have this wonderful, rich broth as much as it is because the chickpeas themselves are much better cooked from fresh than out of a can. It made a huge difference in the Potato Fennel soup. I only added about one-fourth of a cup of cream, but it tastes and feels like much more due to the creaminess of the chickpea liquid. Do yourself a favor and give it a try. I think you will be as pleasantly surprised as I was. 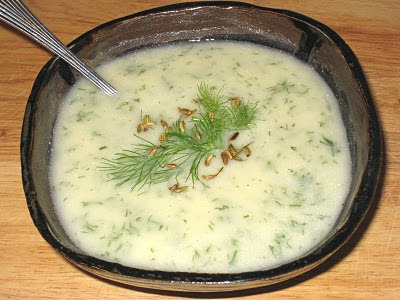 And because I had fresh dill around, I thought it would complement the potato and fennel, which it did. Some fennel fronds and toasted fennel seeds make the perfect garnish. POTATO FENNEL SOUPMakes 8 servings. Heat oil and butter in a large dutch oven over medium low heat. Add the onions and fennel and sweat them until tender, about 10 to 15 minutes. Add coriander, salt and pepper and cook for about one minute, until the coriander is fragrant. Add the chicken broth and the potatoes. Bring to a boil, skimming off any foam that accumulates on top of the pot. Lower heat, cover, and cook for 20 minutes, until the vegetables are all tender. Remove from the heat puree with a stick blender or in a blender or food processor. Return to the heat. Add more water if it is too thick. Add the cream, lemon juice, and dill. And stir to incorporate. Taste and adjust for seasonings. Serve hot, garnished with fennel fronds and the toasted fennel seeds. I have just made this and it was absolutely delicious! I didn't add the fennel seeds as they are very hard even when crushed but it didn't need it. Would rate this as my favourite soup now...and I make a lot of soups! Can't get enough of it!!!! I understand how you feel about the fennel seeds. They are definitely an acquired taste. I love them now, but it took some time for me to get used to them. Thank you for stopping by my blog, and for taking the time to let me know how the soup turned out for you!